A slightly older model Corolla than the one we bought. In the end, the Corolla won because we could get one with 40,000 miles and 3 years less than the Lexus IS200. It's also more practical. So, I am now a car owner again for the first time in nearly 3 years, with a lovely 54 reg T-Spirit in the silver shown in the picture above. It fits the car seat as it has iso-fix, and is nicely built. It's also less hungry for fuel than the Lexus would have been. But my heart still misses the idea of the IS200. Some other time, perhaps. Letter from The Wetherby News. 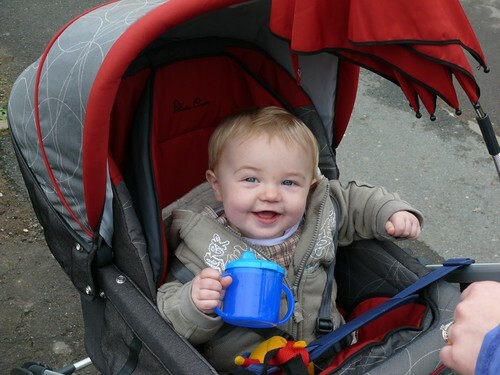 Nathan has been campaigning for infant's rights, or more specifically, for infant's changing facilities here in Wetherby. In reality, with the exceptions of the new Costa Coffee, the Morrisons Café, and Café Aprés (in Boston Spa) none of the local cafés and eateries have decent changing facilities. When asked, there was quite a variety of responses from the landlords and owners; The Scott Arms in Sicklinghall already have a changing mat and great child facilities, but are considering a proper changing stand. Thr3 in Wetherby is also planning to get a changing stand. Our Campaigner Out and About in Wetherby. The Muse was less forthcoming – apparently, children are not in their mission statement and not wanted. Le Bon Appetit, whilst a great place for a meal, have the view that you can change the baby on the floor. That's the floor which is filthy, with no mat and generally very low hygiene standards. To put this in context, a proper changing stand takes very little space, and can be fitted into most existing rooms. They aren't expensive, only £150 or so. Nathan plans to continue his campaign so we'll report if the places that promised better facilities have delivered.